Hunting for the perfect home economics course to add to your child's studies? You've found itLIFEPAC Family & Consumer Science for grades 7-12! This invaluable, one-year course covers relevant topics such as housekeeping, cooking, clothing, decorating, finances, child care, and more! This colorful, consumable Alpha Omega curriculum contains ten worktexts. Does your child know how to cook a meal, sew his clothes, decorate a room, or care for a baby? With LIFEPAC Family & Consumer Science for grades 7-12, he will! This comprehensive, consumable course includes fun, practical topics every student should know. Interesting topics teach everyday tasks your child will do throughout lifesuch as homemaking skills, cooking, cleaning, decorating, personal finances, child care, and more. This one-year Alpha Omega curriculum also emphasizes the importance of building a Christian home life, good character qualities, and practicing financial freedom. LIFEPAC Family & Consumer Science is the perfect, self-empowering course to add to your high schooler's studies! But there's more! LIFEPAC Family & Consumer Science is divided into ten individual worktexts to motivate your student to learn! No huge, intimidating textbooks here. And for parents, this must-have course comes with a handy teacher's guide. Filled with helpful information, this resource includes teaching tips, additional enriching activities, and clearly outlined objectives. Plus, this home economics course has flexible, self-paced lessons made for personalized instruction! What could be better? Try this best-selling curriculum for yourself! 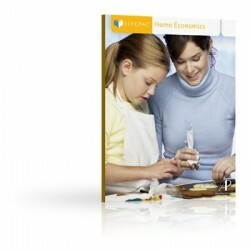 Just order LIFEPAC Family & Consumer Science for grades 7-12 today.